Iran appears to be shifting its attention from low-priced oil to gas, gearing up to increase production to 100 million cubic meters of gas per day at its South Pars field by March 20, the end of the country’s calendar year. Iran’s oil minister, Bijan Namdar Zanganeh, said Jan. 2 that the National Iranian Gas Co. (NIGC) has been developing new “phases,” or development areas, in South Pars, the largest known gas field in the world. The field, situated in the Persian Gulf, contains an estimated 14 trillion cubic meters of natural gas and 18 billion barrels of condensates. It now has 28 phases. Besides gas, these products include butane, cement, diethylene glycol, gas condensates, light and heavy polyethylene, methanol, monoethylene glycol, propane, triethylene glycol and urea fertilizer. Against this backdrop, energy companies from Britain, France, Germany, Italy and Russia are negotiating with the NIGC on cooperation in building gas pipelines and processing plants, according to Asghar Soheilipour, the director of the NIGC’s Investment Committee. Other countries reportedly involved in the talks are China, Japan and South Korea. The focus of the talks, Soheilipour said, includes “issues of modernization of gas pipelines in the country, as well as projects for the construction of gas pipelines from Iran to Iraq, Turkey, Pakistan and other countries.” He didn’t identify the companies involved in the negotiations. As long ago as Sept. 10, Russian Energy Minister expressed interest in having Russian companies, which he also did not name, invest in Iran’s energy sector, including the possible construction of as many as four pipelines to export Iran’s gas. Another country that has expressed great interest in importing Iranian gas is neighboring Pakistan. In Islamabad, Shahid Khaqan Abbasi, the minister for Petroleum and Natural Resources, said his country needs the fuel badly. 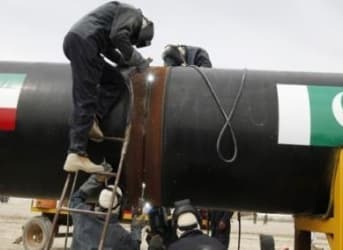 Abbasi told Iran’s Islamic Republic News Agency (IRNA) that Pakistan has already bought tens of millions of dollars’ worth of Iranian gas and that his country has a “serious intention” of completing its half of a gas pipeline project with Iran. In fact, he said, Islamabad is considering building more pipelines, which he said would be beneficial to both countries. Iranian officials are also meeting with large European companies including Britain’s BP, Eni of Italy and Rosneft of Russia. They are said to be ready to invest in Iranian energy projects as soon as Western sanctions on the Islamic Republic are lifted. And that is the hinge of all these negotiations. Germany and the five permanent members of the UN Security Council – Britain, China, France, Russia and the United States – imposed the sanctions until Iran can satisfy them that its nuclear program is not designed to build weapons. Iranian President Hassan Rouhani said Dec. 15 that he is prepared to reach a deal with these countries and bring the sanctions to an end.